With two new Chromecast devices announced today by Google, it is only fitting that the app for Android has been updated as well. The updated app is available now in the Google Play Store and it brings a huge number of updates to support better content searching and apps that can use Chromecast already installed on your device. The update is version 1.12.32 for those keeping score at home and is designed for both Android phones and tablets. 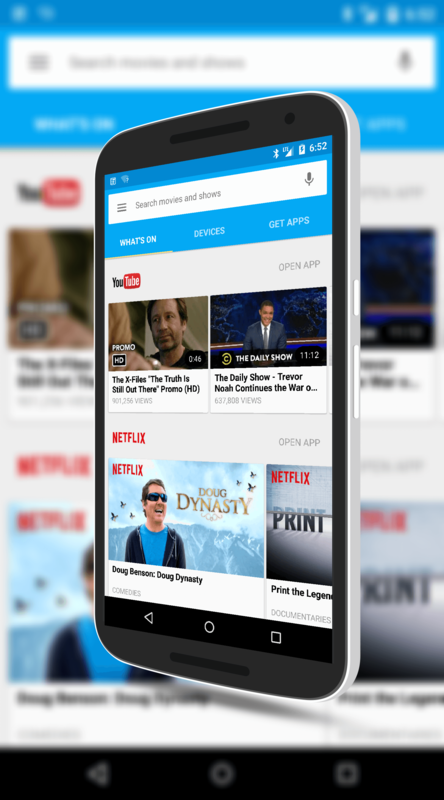 can see content that is available from Netflix, YouTube, content you can purchase from Google Play and apps that you can use already installed on your device. You can also see what music apps you have installed that support casting. The rundown of new features and updates in this build is pretty impressive and even if you don’t plan on getting the 2015 device, you would still benefit from having this latest version of the app. What’s On: Browse popular and featured content from your favorite cast-enabled apps. Devices: Personalize backdrop with Facebook and Flickr photo albums and control (play, pause & change volume) all your Chromecast devices. Get Apps: Discover new offers and cast-enabled apps from content partners, through our curated and merchandised experience. Search: Find where you can cast your favorite movies and TV shows. I will be posting a review of the new app in a few weeks after I receive my new Chromecast and let you know how it performs. Given all of the improvements with the app that are in this release, I am expecting a lot from it!